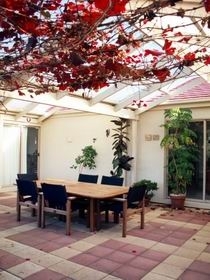 In our quiet home close to the city, overlooking parkland and Freeway Golf, and with extensive views, you will experience a home away from home. 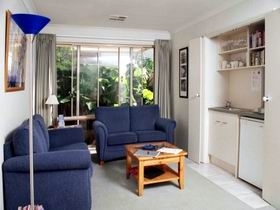 A large living area with many comforts and a kitchenette makes your stay here easy and attractive. 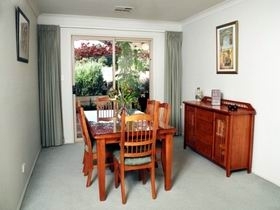 You can breakfast downstairs in style, or take a leisurely breakfast in your own area at your convenience. Nearby there are simple restaurants where you can eat in or take away excellent Thai-Vietnamese or Indian Food or simply Chinese. A short drive in the car or the Freeway Bus takes you to Lygon Street or the city where you can shop all day in Melbourne, visit all Melbourne's attractions and theatres. Here,close to the Freeway you have a good starting point to visit all Victoria's sights, whether it is the Great Ocean Road, Healesville Sanctuary, many wonderful wineries or even the snowfields.